At 7:30 a.m. on Wednesday, January 7, a team of vineyard workers began harvesting frozen grapes for ice wine at Casa Larga Vineyards. To harvest the grapes, the winery needs a sustained freeze with temperatures below 17 degrees Fahrenheit for at least 4 hours. Over the next 7 hours they harvested 11,000 lbs (5.5 tons) of grapes and pressed them immediately. Pressing the grapes outside is a necessary step for ice wine - it keeps the water in the grapes frozen to ensure that only the concentrated juice is extracted. 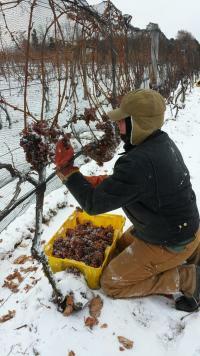 "This harvest is going to make some excellent ice wine," comments Matt Cassavaugh, winemaker. "We are very happy with the quality of the fruit. Luckily, our vines had minimal damage after last winter and we had a robust harvest in October. That gave us plenty of fruit to leave on the vine for ice wine, and we were lucky again that the recent weather left the fruit in good condition." Wine made from the grapes harvested this week will be on the shelves in three years&apos; time. The harvest brought in Riesling, Vidal Blanc and Cabernet Franc grapes. The winery currently produces 6 ice wines: Vidal Blanc, Cabernet Franc, Riesling, Gewurztraminer, a highly unique ice wine field blend called Block 1 as well as an ice wine cuvee made with their champagne. Casa Larga is also working on a new ice wine product that will be unveiled at the upcoming New York Ice Wine & Culinary Festival. On February 14, 2015, Casa Larga will host the 7th Annual New York Ice Wine & Culinary Festival. The festival is a celebration of New York&apos;s wineries that produce traditional ice wines. For more information on the festival, visit http://www.casalarga.com/Events/NYIWCF. Casa Larga produces the most awarded ice wines in the United States. They consistently win double gold and best of class awards. Most notable are Best Dessert Wine at the 2008 International Wine & Spirits Competition in London and an unprecedented dual awarding of Best of Class to both the 2008 Fiori Vidal Blanc and 2009 Fiori Riesling at the 2012 Pacific Rim International Wine Competition.